Jeb Bush destroying campaign finance rules: His tactics will be the future of presidential campaign fundraising. 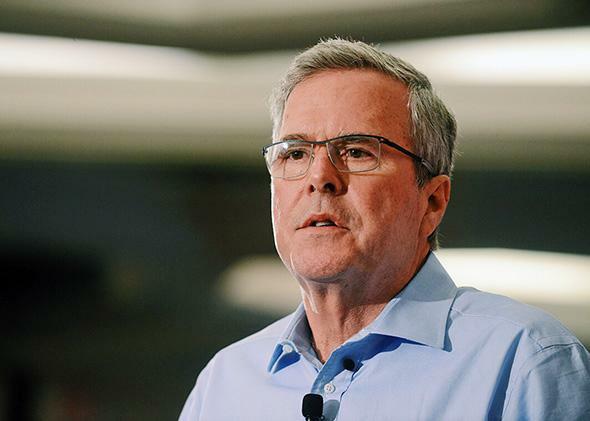 Jeb Bush is tearing down what little campaign finance law we have left. (Pseudo-non)candidate Jeb Bush speaks at the First in the Nation Republican Leadership Summit on April 17, 2015, in Nashua, New Hampshire. In February, the Campaign Legal Center, a group which works on campaign finance reform issues, released a “white paper” contending that many of the leading potential presidential candidates were likely breaking federal law by not declaring their candidacy or setting up a “testing the waters” committee for a presidential election run. Such a declaration, among other things, limits donors to giving only $2,700 to the (would-be) candidate for the presidential primary season. It was an excellent report, but many shrugged off its findings as just one more way in which the campaign finance system has begun to unravel since the Supreme Court’s Citizens United decision. But news this week that Republican (pseudo-non)candidate Jeb Bush intends to outsource much of his campaign to an allied super PAC reveals that Bush’s decision to delay declaring his candidacy has allowed him to undermine one of the last rules in campaign finance law. Worse, his approach will be the new model of presidential funding in future elections and greatly increases the threat that large donors will have even greater influence over electoral and policy outcomes than they already have. The idea that Jeb Bush is not “testing the waters” for a presidential run is absurd. He is appearing at presidential candidate forums, traveling to early primary and caucus states, and leading the Republican field in fundraising. While Bush isn’t alone in delaying his formal campaign announcement and the rules that go with it, he has created unprecedented connections with the “Right to Rise” super PAC, whose sole purpose appears to be the election of Bush as president. * The Sunlight Foundation reported that Bush has already headlined 47 events for his super PAC, with five more events this week. And the Associated Press reported that once Bush becomes a candidate, he plans to outsource many of the core functions of his campaign to Right to Rise, including expensive television advertising and direct mail. To understand why this development is so troubling, we need to go back a few years to the emergence of super PACs and the argument for why these groups are allowed to accept unlimited contribution limits to support candidates for office. The Supreme Court has long recognized that the government constitutionally may limit contributions to candidate campaign committees to prevent corruption or even the appearance of it. If you can give a candidate $1 million, the candidate may be too compliant to your wishes, and the public could believe the candidate is being bought. Although you have a First Amendment right to contribute to candidates, the court has allowed limits on the amounts to serve these anti-corruption purposes. Before Citizens United, however, it was not only candidate committees that were limited in the contributions they could receive. Political action committees, or PACs, operating in federal elections to support or oppose candidates for office also could accept no more than a $5,000 contribution from an individual in the election season. They also couldn’t take money from corporate or union treasuries. In Citizens United, the Supreme Court held that independent spending by corporations and others could neither corrupt a candidate nor lead to the appearance of corruption. When spending is truly independent, the court declared, the absence of coordination prevented corruption. In litigation and administrative action after Citizens United, federal courts and the Federal Election Commission allowed PACs that did not make contributions to candidates to accept unlimited sums from individuals, corporations, unions, and others. The theory was that if independent spending cannot corrupt, then contributions to fund that independent spending couldn’t corrupt either. The theory rests on the idea that the candidate and the super PAC aren’t coordinating their strategies. While a candidate can support a super PAC and even ask people to give money to it, the candidate and the PAC cannot agree on campaign strategy, such as what ads to run and where. This in theory makes giving to the super PAC less valuable to the candidate because the super PAC might act at cross-purposes with the candidate’s campaign. That theory is thin to begin with—super PACs are valuable because they have already proven adept at following a candidate’s lead without formal coordination—but Bush’s campaign strategy has completely undermined it. Because Bush claims he is neither a candidate nor even seriously considering a presidential run, the anti-coordination rules don’t apply to him. He can talk about future campaign strategy all he wants and set the Right to Rise robot to work once he declares his candidacy. More importantly, by participating in literally dozens of fundraisers for Right to Rise during a period when donors know he can fully direct what it does, donors know the best way of gaining influence over Bush (and the chances for influence with a future Bush administration) is by giving money to the group—lots of it. In the old days (think the days of the fundraising of Bush’s brother, George W. Bush), the main way of gaining influence was by becoming a campaign bundler. Bundlers not only give the maximum few thousand dollars to the candidate’s campaign; they also get friends, relatives, and acquaintances to do the same. Now, one doesn’t have to become a bundler for the campaign to curry favor: One can simply write a check for $1 million or more to Right to Rise. By signaling that Right to Rise is his campaign arm, Jeb Bush has broken down the wall between his super PAC and his campaign committee in the eyes of donors. Preventing coordination and preserving independence was one of the last walls that were left. The next step will be simply handing $1 million checks to candidates. Right now that’s still illegal, but campaign finance opponents will challenge those candidate contribution limits as ineffective since (the Bush campaign will show) super PACs can serve almost the same purpose. Indeed, campaign lawyer Jim Bopp (the brains behind the Citizens United lawsuit) signaled as much this week, arguing that the way to take unaccountable money out of politics is to let individuals give whatever they want directly to candidates. Bush is more than lying about his intentions to become a presidential candidate. He’s undermining what little law we have left to stop the super wealthy from having even greater influence over our elections and politics. It’s something to consider as Jeb Bush gets his audition before the Koch brothers, who have promised to have their network spend up to $889 million on the upcoming elections. *Correction, April 22, 2015: This article originally misstated that Bush himself created the Right to Rise super PAC. Bush created the Right to Rise PAC, and his political advisers deny he created the Right to Rise super PAC.